Grassy Knoll: When Is the Right Time to Fertilize and Aerate Your Lawn? To have and maintain landscaping in Mississauga that is beautiful basic lawn care practices such as watering, fertilizing and mowing are required. 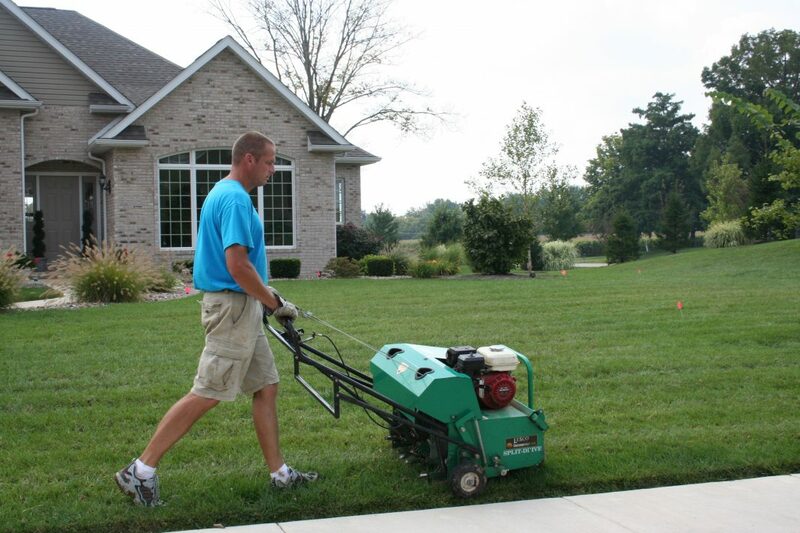 Aeration is vital for a healthy lawn. It allows water and air to penetrate lawn thatch or built-up grass. Small holes in the soil perforate it and allow nutrients, air, and water to penetrate the roots of grass. The process aids in root growth and the production of a vigorous lawn. The primary reason for aerating is alleviating soil compaction where there are too many solid particles in an area. The compaction prevents proper circulation of nutrients, water, and air. Heavy organic debris and excess lawn thatch buried beneath the surface of the grass can starve roots from the essential elements. Areas of heavy use – Pets and children, playing in a yard contribute to the compaction of soil. Playgrounds and racetracks also are prone to soil compaction. Newly constructed homes – Often the lawn’s topsoil that has been buried or stripped and grass established on subsoil is compacted by construction traffic. Spongy feel or dries out quickly – An excessive thatch can cause these conditions. Soil layering – A finer texture of the soil is placed over existing soil with a coarser texture. Layering disrupts draining. Aerating breaks up the layers and allows water to flow and reach the roots. The growing season is the best time to aerate. The grass will heal, and open areas will fill in after the removal of soil plugs. The fall or early spring is best for cool season grass. Late spring is the ideal time to aerate warm season grass. Fertilizer has three numbers on the label. The figures indicate the amount of nitrogen, phosphate, and potassium in the fertilizer in that order. Those are the most needed nutrients for a lawn. A bag of fertilizer labeled 20-5-10 has 20 percent nitrogen, five percent phosphate, and ten percent potassium. The other 65 percent of the fertilizer is filler material that aids in applying the fertilizer evenly. The mixture labeled 20-5-10 is a basic mix for spring. Slow-release fertilizer is recommended. The nutrients are broken down over an extended period. Slow-release fertilizer does not have to be applied as often as other types which are applied about once each month. Depending on how often the landscape is watered, slow-release fertilizer should be applied consistently at six to eight-week intervals. Of the three nutrients, nitrogen is the one that should be given the most attention. Nitrogen causes grass to turn green and aids in growth. You want to make the grass as green as possible while preventing it from growing too fast. A 25-0-4 blend of fertilizer will make you feel you are baling hay instead of mowing a lawn. When soil temperature reaches 55°F in the spring, is the best time to fertilize. Nature has a way of letting you know when the soil has reached that temperature. Grass starts to grow and lilacs blossom. For many areas of the country, fertilizing should take place in mid-April. Aeration is a process that is needed under certain conditions. It should be done when the grass begins to grow. All lawns need a fertilizer that contains nitrogen, phosphate, and potassium. The first treatment should be applied when the ground temperature is 55°F. Additional fertilizer is added every four to eight weeks of the growing season.